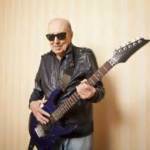 Looking for a professional guitar teacher in Orange County? Mark Hamrock with Hamrock Music Instruction has been one of the premiere guitar instructors in the Orange County area for the last 16+ years, teaching beginners to advanced students in every genre including blues, rock, jazz, classical, country, etc. Mark has toured nationally and recorded with various groups while earning a Bachelor of Music Degree in claasical guitar through the University of California Irvine. Through many years of teaching well over a thousand students Mark has developed a highly effective method for learning the guitar that works for any student and includes a well balanced combination of technique, ear training, scales, improvising, and theory, all while applying it with songs that the individual student picks. If you are a beginner or a current player who has hit the proverbial wall, Hamrock Music Instruction is the place for you! Call Mark today at 949-230-7136 to get started on breaking through barriers and turning your playing up to 11! Guitar Lessons from a qualified guitar instructor. 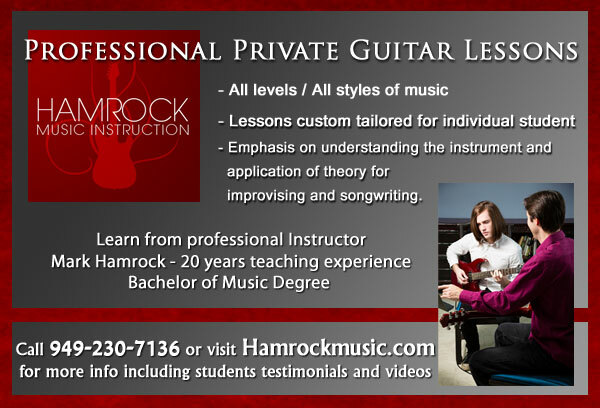 Mark Hamrock has been teaching guitar lessons and bass lessons in Orange County since 1995.